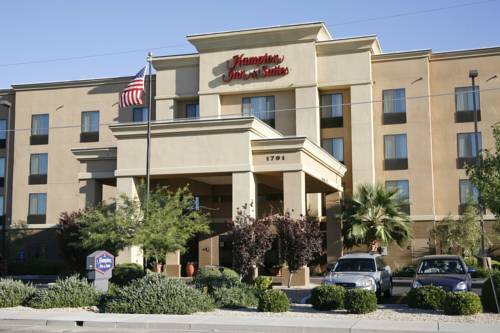 The Hampton Inn - Suites Kingman AZ hotel is located in the main business district at the Stockton Hill Rd. Exit off Interstate 40 next to the Kingman Regional Medical Center in one of Arizona*s fastest growing cities. We are within easy driving distance of Laughlin and Las Vegas the Grand Canyon Hoover Dam the Colorado River and the ghost town of Oatman Arizona. We are close to the Historic Route 66 Museum and our guests can enjoy many local activities including golf tennis and hiking in the nearby Hualapai Mountains. All of our spacious 86 rooms and suites have a refrigerator microwave coffeemaker hair dryer iron and ironing board. Our hotel features a fitness center suite shop meeting and banquet facilities for up to 150 people. Whether traveling to Arizona on business or pleasure our Hampton Inn - Suites guests enjoy amenities which include complimentary On the House breakfast with hot items daily complimentary local phone calls high-speed internet access a business center and guest laundry. We love having you here at the Hampton Inn - Suites Kingman hotel in Arizona. A show cave and several dinosaurs await along this desolate stretch of historic Route 66. Elevator drops 200+ feet down into cave, which features Civil Defense leftovers, and the Chapel of the Ages.